Midnyte Reader: Witches on the Road Tonight. 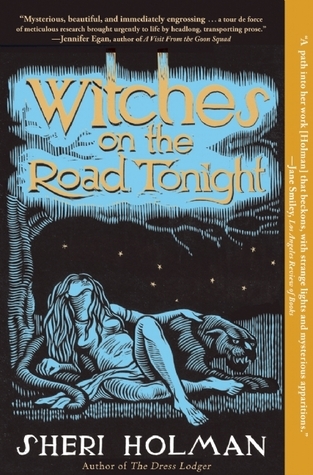 Title/Author: Witches on the Road Tonight by Sheri Holman. Favorite character: Cora and Willis Alley. All in all: A quiet book that gets under your skin. Favorite Quote: "Once witches slip in, they're hard to get rid of." ~Cora Alley. Synopsis: As a child growing up in Depression-era rural Virginia, Eddie Alley’s quiet life is rooted in the rumors of his mother’s witchcraft. 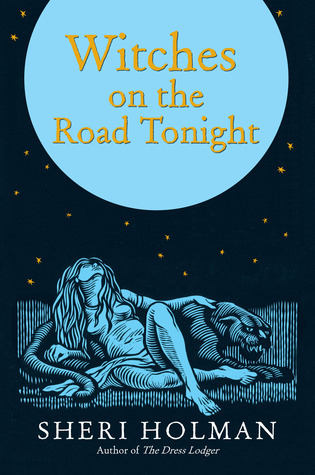 But when he's visited by a writer and glamorous photographer researching American folklore for the WPA, the spell of his mother’s unorthodox life is violently disrupted, and Eddie is inspired to pursue a future beyond the confines of his dead-end town. My Thoughts: "Of all the props I saved only the coffin remains." This is the first line from Witches on the Road Tonight which made my mouth water in expectation. Even before I opened the book it just gave off an aura of mystique and intrigue. However, it was not quite the story I was anticipating even though it won me over by the end. I was hoping for more magic, more witches, heck, more coffins from this book, but it was really a tale about a family and their hopes, fears and hurts. More literary than supernatural Witches crept up on me slowly yet once it had me, it wouldn't let me go thanks to rich, mysterious characters with deep desires kept half hidden making me as a reader, puzzle over what was behind their thoughts and actions. The buildup is a bit slow, but needs to play its part and I'm thankful that I was patient enough to keep delving into the story. There were supernatural elements to this book, yet after I read them I still wasn't sure if the author meant for the reader to take them literarally or metaphorically. Were the magical parts just the mind of an unreliable narrator or is there really something to the mountain magic that the Alley family has passed on? Is each reader to decide for themselves or could it be a bit of both? Magic or metaphor? Unfortunately, not everyone was granted their wish and at times it broke my heart. The longing, misunderstandings, jealousy and resentment is sharp and painful. The writing is beautiful. The details of the character's lives made me feel as if I was there. Descriptions of the mountains where Cora lived were especially picturesque and powerful. Sometimes the prose is complex due to the character's thoughts, but I still felt connected to them, still felt like a witness to the story. The folklore that is woven into the book gives an otherworldly feel to the narrative and at times an eerie background. I can't say I loved the ending, but for some reason wasn't dissatisfied by it either. I think by the end I understood what had happened in each character's life to bring them to where they were. I think there is more to be explored in this book, but I have yet to figure out what it is. This is a book I will continue to contemplating as questions linger and haunt me. I love a book that keeps you thinking. I also love descriptive elements like that as well. Really puts you in the scene. Hm... will have to check this one out. I never heard of it before. I saw this is an airport bookstore a while back and I am was tempted to pick it up just from the cover and title, but once I read the synopsis I was totally pulled in. This sounds interesting. It's hard to find a book that delivers something unexpected and keeps you thinking after you've finished.